"For Freedom" - On 3 August 1305, Wallace was captured at Robroyston near Glasgow, and taken to London where he was hung, drawn and quartered at Smithfield on 23 August. Seven hundred years later to the day, David R Ross, Convenor of the Society of William Wallace, walked these 450 miles in 19 days in memory of Scotland's martyred hero, culminating in a long overdue 'funeral' service in the church of St Bartholomew the Great and an extraordinary commemorative march through London. For Freedom is both a celebration of and testimony to the fact that the spirit of Wallace is still very much alive in Scotland, a legacy which inspires and instils pride in Scots even today. 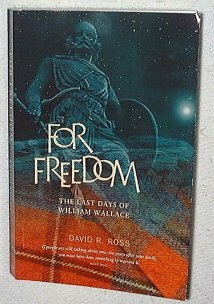 To order "For Freedom" via the Society of William Wallace website, click here For Freedom, or proceed to Luath Press. 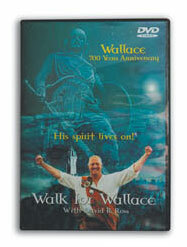 click here: Walk for Wallace.